The Coin-Up Challenge is a minigame in Mario & Luigi: Dream Team. It is played near the beginning of the game at the entrance of Pi'illo Castle, and cannot be replayed again. 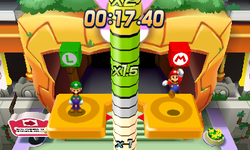 In this minigame, Mario and Luigi, who are standing on platforms opposite each other, must hit their respective blocks in synchronization to reach the top. Broque Monsieur gives the Bros. 50 coins to begin with, but they can multiply that amount by 1, 1.5, 2, 2.5, or 3 depending on how high they reach. They receive a Mushroom just for playing, and if they reach the top they receive a 1-Up Deluxe. This page was last edited on November 15, 2018, at 09:59.